Recently I have become a core member of my local Transition Town, Kensal to Kilburn. But for several years I have been photographing events and projects initiated by Transition Towns, all of which are about engaging in, or promoting sustainability. The Stroud Potato Day was my first venture to a Transition event outside of London, a 2.5 hour journey to be precise. 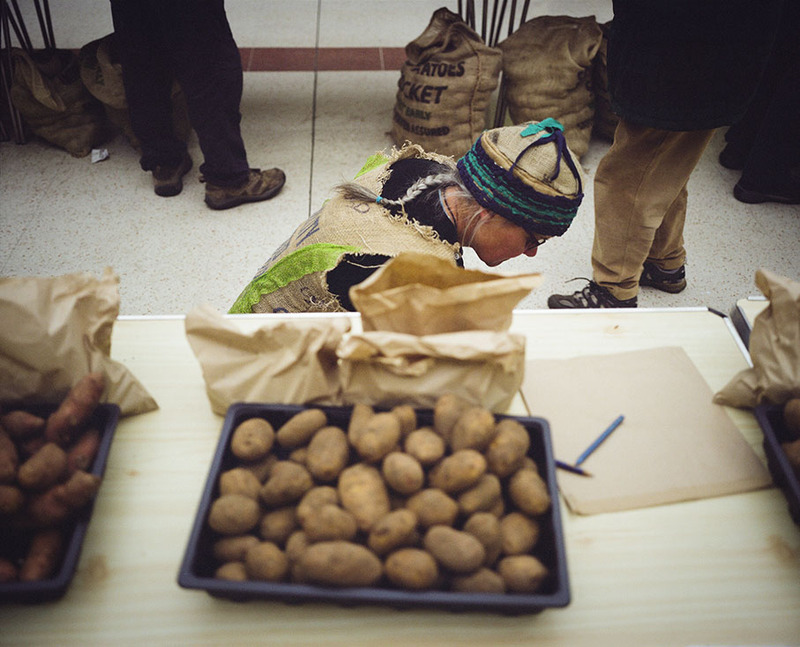 The annual selling of tubers in this west country market town was flagged up in Rob Hopkins’s (co-founder of the movement) recent book, as it’s been running successfully for several years. The group positioned themselves in the town’s main indoor shopping mall, Merrywalks, in order to utilise the busy Saturday footfall. Passers-by and enthusiasts alike are able to choose between 18 varieties of potatoes to purchase. Tubers are for growing rather than cooking. As with previous years business was brisk, with one variety selling out within the first hour and a half. Shoppers were drawn in by fresh cake made with potato flour, and the unusual sight of a Transition member donned in a hessian sack. Thanks to Helen and all at Transition Stroud and Down to Earth for persuading me to grow spuds for the first time this year. More of my Transition Town images here.